You can now save $80 on Beats Solo 3 Wireless headphones | What Hi-Fi? Beats headphones remain ever-popular thanks to their sleek designs, Apple tie and unwavering celebrity support. And now that the bass-heavy sound found in the original models has been fine-tuned, and they sport some of the biggest battery lives in the headphone market, we're less against the idea of recommending them to someone who's set on the Beats look - especially when there's a hefty discount to be had. 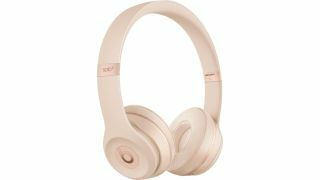 One of Beats' top-end on-ear headphones, the Beats Solo 3 Wireless are widely available in a range of finishes for around the $240 mark, however you can now bag yourself a matte gold pair for just $159.99 at Best Buy... if you're quick, that is. The also-reduced matte silver pair at $189.99 has, sadly, already sold out.